We have been to many Turkish restaurants over the years, but we were really excited to learn of a new Kurdish restaurant, The Gundis ( 2909 N Clark St, Chicago, IL 60657). The Kurdish people live in the region of southeastern Turkey and northern Syria, Turkey and Iran. Unfortunately, most of what we hear of Kurdistan and the Kurds relates to conflict and instability in the region, so we were excited to learn about another aspect of the Kurdish culture. The Gundis restaurant was started by two Kurdish immigrants from Mardin province in Turkey: Mehmet Besir Duzgun and Mehmet Besir Yavuz. However, reflecting the multiculturalism of Chicago, their Executive Chef, Juan M. González, hails from Mexico. We met up with an adventurous foodie friend at The Gundis, which is in an unsuspecting spot on a surprisingly quiet stretch of Clark Street. The restaurant is clean and modern, witch minimal decor and exposed brick walls. The Gundis is open for breakfast, lunch and dinner – so has more options than you may suspect. We saw some familiar favorites, but were excited to see some Kurdish dishes that we had never even heard of before. For breakfast you might be treated to Baklawa Crepes ($11.95) or a complete Kurdish Breakfast for two with all of the fixins: including eggs, fresh cheese, Kurdish bread, sesame butter, tomatoes, cucumbers and more ($34.95+, depending on the egg option). For lunch and dinner there is a bit more meat, focusing on the staples of beef, chicken and lamb, but there is plenty for vegetarians too, including a surprisingly thorough salad list and more unique options like Tiršik (spicy veggie stew – $15.95). We started out with hummus as a mezze ($6.95), but there were plenty of other appealing options like octopus salad ($8.50), and ezme with walnuts (a spicy Turkish salad with chopped tomatoes and onion with pomegranate molasses – $8.50). For entrees there were a variety of shish kebabs and even an intriguing-sounding encrusted salmon. We asked the server what the most emblematic Kurdish dishes were and he suggested the Sac Tawa ($24.95) and Mardin Special ($21.95 – both with protein options). The Mardin Special was vaguely described as fried eggplant with lamb, tomato and yogurt sauce. However, the dish that arrived was more than the sum of its parts, and was probably our favorite dish of the night. The yogurt sauce was a perfect counterpoint to the slightly spicy tomato sauce, and the lamb was perfectly cooked and fall-off-the-bone tender. As you can see above, the eggplant was also arranged in a dome shape, which we were not expecting!The Sac Tawa (above) was an extremely generous portion of chicken stir fried with tomatoes bell peppers, heavily spiced. We later learned that this is a traditional pre-wedding dish. Our friend ordered the lamb shank ($26.95), which was a staggering proportion, and was perfectly cooked and tender. The dessert menu sounded delicious – so we decided to order the Kurdish Tea with Kurdish cookies ($8.50) and the goat’s milk rice pudding ($7.95). The rice pudding had a delicious tang, and we loved the sesame and pistachio-based cookies. Everything we tried at The Gundis was delicious, and prepared in an elevated, clean style. We would recommend The Gundis to anyone who likes Middle Eastern Food but is looking for something a little bit different. Though Kurdish food is similar to Turkish, it has its own unique twist, and should definitely be experienced! We have had a lot of Middle Eastern and Mediterranean food in our day, and to be honest, a lot of it tends to run together. So we are always glad to happen upon spots that serve more regional dishes beyond the ubiquitous kebabs and hummus. At an unassuming strip mall in Avon, we found a hidden Turkish gem doing just that: Istanbul Grill (35840 Chester Rd., Avon, OH). One thing that sets Istanbul Grill apart is that it serves some slightly more unusual (and authentic) Turkish dishes you won’t see elsewhere. For example you can get kebabs over diced bread, a serving style that is common in Turkey, but I haven’t really seen much in the US. They also serve Lahmacun ($13.49) on Sundays – a Turkish pizza-style flatbread topped with ground lamb. The decor at Istanbul Grill is simple but comfortable, with bright red walls and enlarged photos of Turkey hung throughout. We received a basket of fresh Turkish flatbread while we perused the substantial menu, with an assortment of meze, salads, kebabs (filet, lamb, chicken, shrimp and doner) and specialty meat dishes. Though there are some vegetarian options, the menu is very meat heavy. We started off with two distinctly Turkish starters: a riff on Tzatziki sauce – Cacik ($6.99) – which consists of yogurt with dill sauce, and Sigara Boregi ($7.99)- fried phyllo filled with cheese. Both were delicious and comforting, and we think we’d take Sigara Boregi over mozzarella sticks any day. For mains, we ordered the Iskander kebab – lamb and beef carved off a spit, like gyros, served over diced bread with a mild tomato sauce (seen below – $16.99); and the Hunkar Begendi (aka Sultan’s Delight – $17.99) – which was lamb with bell peppers in a tomato sauce, served over pureed eggplant and cheese. We haven’t seen either of these mains on a menu before – so we were excited to try something new. For dessert we finished up with Kunefe ($6.99), a hot dessert with shredded wheat topped with cheese and sugar syrup, which goes perfectly with a hot cup of Turkish coffee. Both main courses were perfectly spiced, and we enjoyed the eggplant and bread as alternative sides to the more common rice. Though the prices seemed a little high, you make up for it in portions, and we were left with enough for the leftovers for the next day. A final plus, the service was friendly and attentive throughout. We highly enjoyed everything we sampled at Istanbul Grill and we look forward to working our way through the Turkish menu and coming back for some Lahmacun! The end of Ramadan is right around the corner, which means it is time for Eid-Al Fitr feasts! Every country has it fair share of festive foods, and Turkey pulls out all the stops when it comes to desserts for holidays. 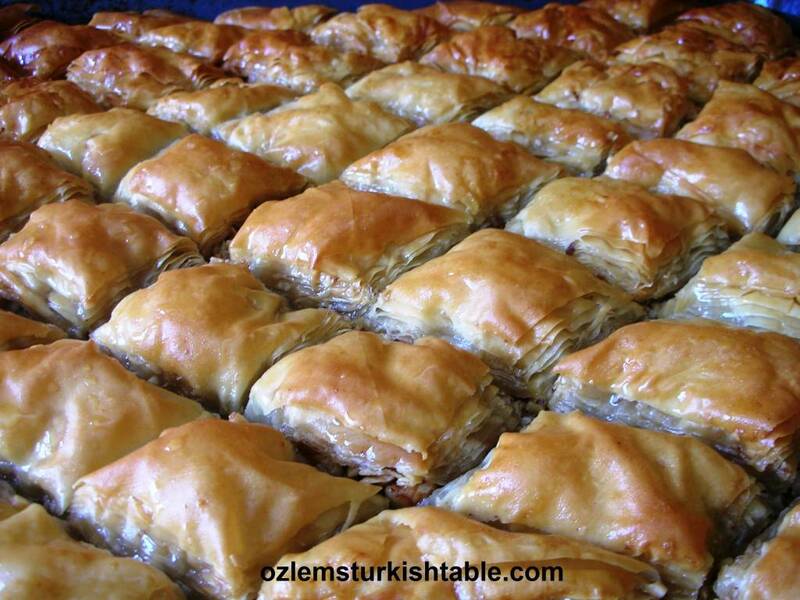 Ozlem’s Turkish Table has a variety of delicious Turkish desserts that would be perfect at any Eid Al-Fitr (known as Ramazan Bayramı in Turkey) celebration, including the well-known baklava as well as lesser-known but still delicious treats like Kunefe and Revani. We had heard from an acquaintance that there was no good cheap food in Istanbul. That could not be less true! Much like Rome, there are a lot of tourist trap places with overpriced low-quality menus, aiming to make a buck on tired tourists by providing sub-par food. However, on the whole, we probably had better luck finding good, cheap food in Istanbul than Rome. One such example of the good options available is Melekler (113 Ipek Sok, off Küçük Parmakkapi Sok). Located in the bustling Taksim district of Istanbul, this place is blink-and-you’ll miss it small. However, the enticing menu of BBQed meats keeps it pretty packed. M ordered a plate of Spicy Urfa kebabs, delicious grilled pita and roasted tomatoes. As you can see above, the portions were more than generous. L had a broiled chicken durum wrap that was even cheaper! Durum flatbread wraps are the specialty of the house here, and are definitely worth a try. Dinner was less than 12 Lira, and the tasty BBQ spread certainly fed the two of us. Melekler is open for lunch and dinner – cash only (though you won’t need to bring much). If you are looking for another quick place for a cheap eats even closer to the touristic center, we also recommend Sultanahmet Köftecisi (Divanyolu Caddesi 12A, Sultanahmet) for amazing, cheap quick kebabs right in the heart of town. We absolutely love the culture of street food in Turkey, and we were completely intrigued by Zester’s videos of the Turkish candy, Osmanlı Macunu, being made on the street. Macun (which means “paste” in Turkish) is basically a colorful sugar lollipop that comes in a variety of flavors, made to order. Each lollipop is composed of several flavors, twirled on a stick in succession and then cured by lemon. You just have to watch! The street food in Istanbul is amazing, and there is a whole lot more than Döner on offer. Though of course the ubiquitous cone of meat is available, we found some options for street food that were completely unique. When we were in Istanbul, we ate as much street food as possible, and we really enjoyed the ubiquitous culture of street stalls and carts. Here are our favorite street eats, but if you’re looking for more, Witt Hotels and Atdaa have great rundowns of the myriad different types of street food in Istanbul. 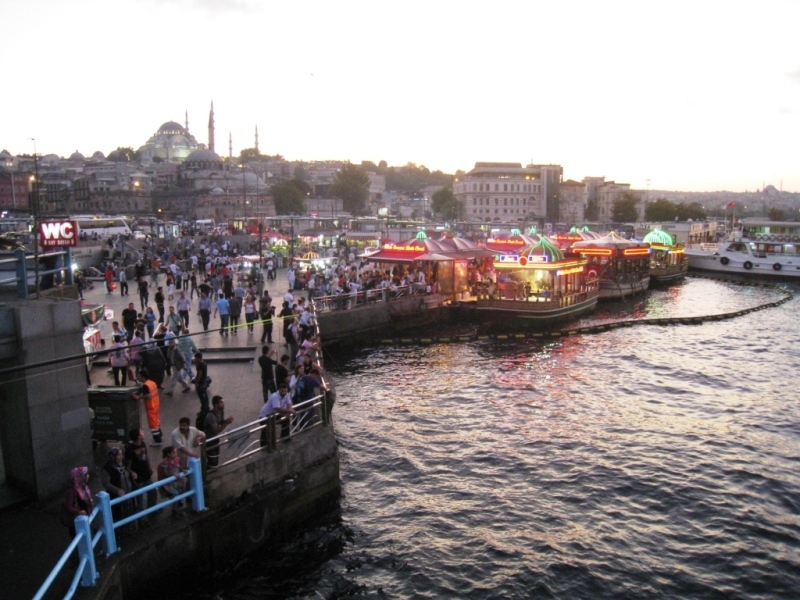 We wish we were enjoying these munchies by the Bosporus right now. Mısır – One thing we never expected to see for sale in Istanbul was something distinctly “new world” – grilled corn on the cob! Much like Mexican elote, misir is served with salt and spices (though there is no butter). This was absolutely one of the most popular street foods, and is surprisingly tasty and filling. Kestane – Delicious roast chestnuts often sold alongside corn, or alone after corn has gone out of season. Chestnuts are a popular fall food throughout Europe, as we saw in Lisbon, and are a great warm-up in chilly weather. Simit – One of the many ring-shaped carb-y options available as street food in Istanbul, simit is a savory bagel-esque bread ring covered in sesame seeds. For breakfast simit, is often accompanied with yogurt and jam. Açma – This similar to Simit, but is sweet and fried. Think of a Turkish doughnut. Halka Tatlisi – If Açma is not sweet enough for you, you graduate to the Turkish churro: Halka Tatlisi. This street food staple consists of fried dough with a glossy sugar glaze. For the sweet tooth only. Dondurma – Turkish ice cream – which has a much denser, pliable consistency. Half the fun is watching the ice cream cone being prepared. Pide and Lahmacun – Thin flatbreads topped with cheese and/or meat, perfect if you are feeling like more of a meal. There are also full restaurants dedicated to these foods, though you can get them on the street. Mussels – Down by the docks we also saw buckets of Mussels for sale (and ready consumption). This particular street food we did not partake in, but we were just about the only ones. We imagine the high turnover keeps everything pretty fresh. We recently wrote about the vibrant coffee culture in Scandinavia, particularly Norway. Adding credence the near-mythic status of Scandinavian coffee is “Bean Everywhere” a wordless video tribute to Scandinavian coffee by the South African Coffee publication, The Coffee Mag, with the much different Turkish coffee in the mix as well. If you are a coffee lover it is definitely worth a watch. After writing our recent post on Asitane restaurant in Istanbul, it got us hankering for some Turkish food. We had excellent food in Istanbul, and even some particularly good breakfasts. We enjoyed the hearty spread of baked goods, cheeses, halva, fruit, yogurt & honey and excellent coffee (naturally). While we have attempted to recreate our Turkish breakfasts on a smaller scale, it turns out there are even some places in Chicago that turn out a Turkish breakfast/brunch. Serious Eats Chicago recently had a feature on what was deemed the best place to catch a Turkish brunch, Pide ve Lahmacun (1812 W Irving Park Rd.). It was already on our list, but with this additional news, we definitely have to go! Every once in a while a restaurant comes along that has a concept so intriguing, you have to try it. Asitane has come up with such a concept: using authentic, historical Turkish dishes spanning nearly 1000 years. Each dish has either been re-created from original Ottoman menus, or re-created from descriptions of dishes served at the time. Each dish on the extensive menu is given a date, which may seem gimmicky at first, but really works. The setting of Asitane is quaint and beautiful, and is located on the ground floor of a renovated old building. We were lucky enough to arrive on a pleasant day, so we decided to eat outdoors, though there is also extensive indoor seating. To start with, we got a sampler plate, which like all of the other items on the menu, was very reasonably priced. We were surprised that it was such a good deal for such a fine dining experience. The sampler plate included four dips (20 Turkish Lira, about $10): Ottoman Hums (1469/1471), Lor Cheese Blend (1898), Fava (no date on this), and a pounded cucumber salad (1844). The Hums was what we might consider hummus, with currants and pine nuts, the Lor was a spreadable mild cheese (much like ricotta) mixed with rosemary, peppers and tomatoes, and the fava bean dip was seasoned with dill. We also received a basket of bread to sop everything up. We then tried what was perhaps our favorite dish of the day: ‘Toyga Aşı’ Summer Soup with Yogurt (14th century). The soup was served cool, with mint and olive oil drizzled on top. It was phenomenal! For an entree we chose “Mahmudiyye” with Dane-i Sarı (1539), stewed chicken with cinnamon, cloves and apricots garnished with Rezaki raisins and almonds. The dish was extremely flavorful, with a pleasing sweet taste that went with the saffron pilaf accompaniment. We highly enjoyed our meal at Asitane, adding even more to our opinion that Turkey has amazing food. To top it off, the setting was lovely, the service was pleasant and the price was extremely reasonable. We also forgot to mention that in addition to your server you will be attended to by the restaurant cat (see below) who likes to visit. To top it off, Asitane is right next to one of the major sights in Istanbul, the Chora Church (Kariye Kilisesi), even though it is a little bit outside of the historical center. If you visit Asitane you are sure to have an extremely unique dining experience you can not get anywhere else (unless you are a time traveler, of course). When lookign for cheap eats in Istanbul, we got this recommendation from the lovely blog Istanbul Eats. Karedeniz is located on one of the many pedestrian side-streets off of the major thoroughfare Divan Yolu, right at the Sultanahmet tram stop. There are picturesque outdoor tables, though as in other places in Istanbul, you may be joined by a feline friend looking for a few scraps (we sure were!). The specialty of Karedeniz is Pide – though they also sell other Turkish favorites like kebabs. Pide is sometimes called “Turkish Pizza” but is in reality a canoe shaped piece of flat leavened dough with a variety of toppings. Pide are not usually a street food, and are often sold in Pide restaurants called “pideci.” This was our first experience with Pide in Turkey, and it was one food we were really looking forward to. The one we got below was cheese – and it was excellent, simple lunch fare, not to mention, easy on the wallet. Other pide varieties available included various combinations of meat and vegetables. M got a generous salad topped with a chicken kebab, which was flavorful and fresh off the grill. If you are in the Sultanahmet, Karedeniz is a great place for great food at a good price. Don’t be lured into the tourist traps! We love Middle Eastern food, so we were definitely excited to find a few options in Lisbon (more reviews to come). Walking down Martim Moniz square, M’s eye was immediately drawn to the döner spinning in the window. In the words of Ron Swanson, a character from one of our favorite shows, Parks and Recreation, “There’s a hot spinning cone of meat in that Greek restaurant next door. I don’t know what it is, but, I’d like to eat the whole thing.” That was pretty much our reaction upon seeing the Ali Baba Kebab Haus. Unfortunately, we had just had dinner, so we vowed to return on another day. About a week later, before a night performance at the Dona Maria II National Theater in Rossio Square, we headed over to Ali Baba for a quick bite. When we arrived, the spot was filled with a fast-moving crowd composed of the local middle eastern community and a strong local/German tourist contingent (let us not forget the stunning popularity of döner kebabs in Germany). 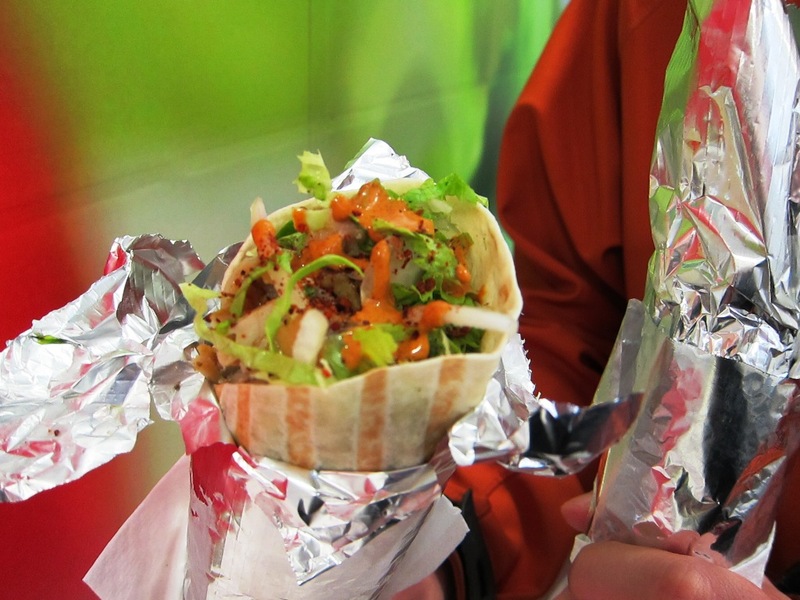 Ali Baba serves Turkish food, and there are only three things on the menu: chicken döner, beef döner and falafel. You can get each filling option in a pita or a durum wrap, along with a side of salad or french fries. 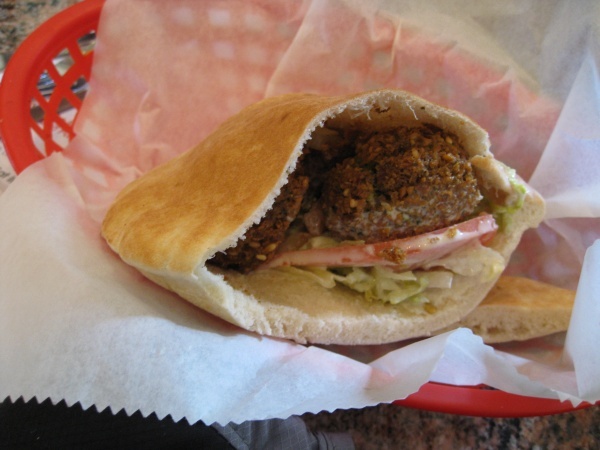 We each opted for a durum – M picked the chicken and L went with the falafel. All of these options are between only 3.5-6€. Once you pick your filling, you tell the sandwich maker what sorts of toppings you want, lettuce, tomatoes, onion, hot sauce (fantastic!) and garlic sauce (similarly awesome). Fair warning – there are no tables, just a tiny stand-up counter in the very tiny store. No surprise, many people take the orders to go. M enjoyed his chicken döner, but found it a little greasy for his tastes. The Turkish-style falafel was tasty, and completely complemented by the garlic sauce. Though we had a little trouble eating the overstuffed durums at the stand-up counter you will definitely be hard-pressed to find a better cheap meal near Rossio Square. Some destinations have “must-do” experiences, visiting the Eiffel Tower, the Golden Gate Bridge, etc., but our favorite requisites tend to be food-related. One quintessential Turkish dining experience is enjoying a meal under the Galata Bridge that spans the Golden Horn in Istanbul. In terms of natural and architectural beauty, Istanbul is a grand city, and the Bosphorus plays a huge part in its history and the landscape. 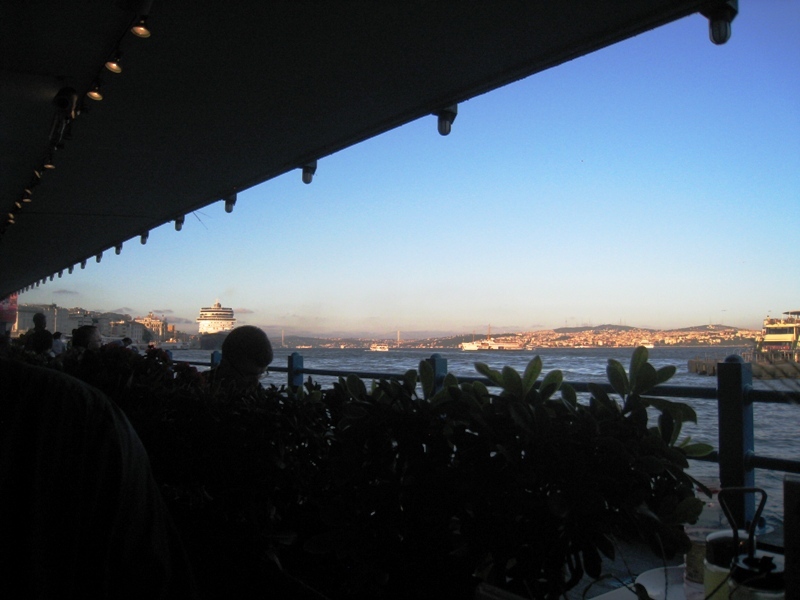 Though we found plenty of awesome cheap food in Istanbul, you can hardly beat the panoramic setting of the Galata bridge. It’s also the perfect place to take in some of the city and its people. The bridge is always bustling, full of pedestrians and fishermen. If you’re craving a Galata dining experience, there are two ways you can go, dining under the bridge itself, or dining on the neon-bedecked fishing boats docked on the Eminonu side of the river. We chose to eat underneath the bridge, (partially because we ended up on the side of the river opposite of the neon boats). There we found a range of eateries serving seafood, from dirt cheap to more expensive, packing in both crowds of tourists and locals. The cuisine is not the draw though, the views are. We found a restaurant serving simple fish sandwiches for 5 Lire and a particularly potent Turkish coffee. Next time around we would love to try the neon fish boats, which were literally jumping and rollicking and blasting music as the sun set. On a hot summer’s day there is nothing better than some ice cream, and given this current heat wave (seems like Brazil in Chicago here today with the humidity) we could use a LOT of ice cream. One of our favorite ice cream permutations is Dondurma, a stretchy and pliable ice cream from Turkey. Dondurma has a texture unlike any commerical American ice cream (almost like taffy), and is flavored with mastic and thickened with salep, a type of flour made from orchids. If you have an ice cream maker, here is a recipe for DIY dondurma. However, part of the fun of dondurma is watching the dondurma sellers prepare the ice cream – we saw them all over Istanbul – check out the video of a seller below. One of the things that we most loved about Turkey were the extraordinary breakfasts we had everyday: yogurt with fresh honeycomb, fresh fruit, cheese and olives, Turkish pastries, the whole works. At one such breakfast we were also introduced to the enigmatic helva, a sweet treat made with sesame seed paste. I have a lot of trouble trying to describe helva since its texture is so unusual – it’s sugary and crumbly, but with the creaminess of peanut butter. The specific variety of helva we had in Istanbul was Tahin Helvası (as in tahini), and we enjoyed varieties with chocolate swirls and pistachio. Helva or helva-like products are widespread throughout the Mediterranean and the Middle East, but it was the first time we had ever tried any other nut butter candies like this. Fortunately, we found Turkish helva in a few middle eastern grocery stores in Chicago. New Location: 4700 Dempster St. If you see that a restaurant is packed full at 3 PM on Sunday, you know it’s probably pretty decent. In the case of Pita Inn, It was more than decent. Talk about bang for your buck! From the outside, the Pita Inn just looks like a typical fast food operation. Same on the inside – there is a counter where you place your order and get a number. One word: Amazing. The menu features a variety of pitas and platters: Chicken and Beef Shewarma, Kifta, Beef and Chicken Kabobs and Falafel sandwiches. There are also all of the classic appetizers: Hummus, Baba Ghanouj, Tabouleh and Dolmeh. Our table ordered 2 falafel sandwiches and 1 each of the chicken and beef shewarma pitas. Each sandwich came in a chewy, obviously-fresh pita at the bargain price of less than $4.50 each. The shewarma sandwiches were tasty and well-seasoned. However, the stars of the show were the falafel. These are some serious falafel – good texture, crispy outside, even better drenched with tahini. Yum! The best part, however, was the fact that the Pita Inn factory was located in a strip mall that shared a parking lot with the restaurant. There was a little window that connected the pita factory to a Middle-Eastern grocery store by a pass-through window. 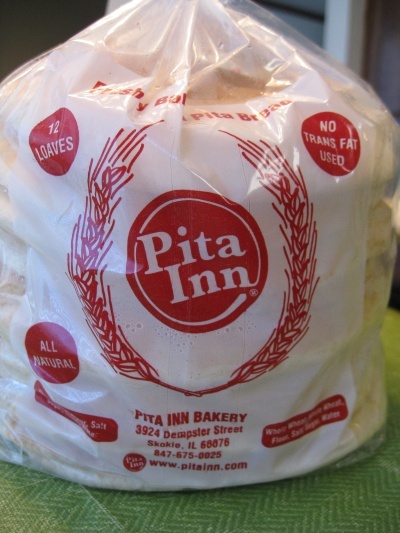 You could buy bags of fresh pitas in the grocery store for less than 4 bucks to take home. Here’s our fresh-out-of-the-oven purchase. As you can see, the bag is full of steam! These pitas were absolutely delicious. Pita Inn doesn’t have a Zagat rating of 24 for nothing.